Was John Glenn's Mercury Friendship 7 flight planned for only three orbits and not seven as has been told? Space history undoubtedly has many more of these apocryphal stories that are too good to check. 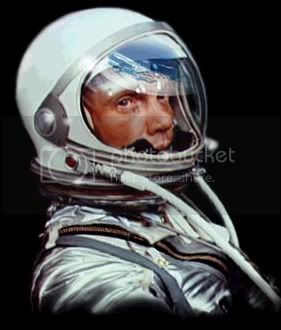 One is the oft-repeated claim that John Glenn was going to fly for seven orbits around the Earth until he experienced problems with his heat shield. At that point, Glenn’s mission was cut short to three orbits and he was told to reenter. The story has appeared in at least one book. William Burrows wrote about it in his engaging 1998 history This New Ocean. On page 340 Burrows states “He [Glenn] had been told before his Friendship 7 thundered over the Atlantic that he would get at least seven orbits.” On page 341, in the midst of describing the suspected heat shield problem, Burrows wrote: “Seven orbits were now out of the question.” Burrows cites the NASA book This New Ocean, which recounts the flight, but doesn’t actually contain the error. The John Glenn error has been repeated in a number of other places. A quick Lexis/Nexis search of news stories during John Glenn’s 1998 space shuttle flight turned up a number of examples. The NewsHour with Jim Lehrer reported that “mechanical problems cut short” Glenn’s Mercury flight. The ABC news show 20/20 also got it wrong when Hugh Downs said that “five hours after liftoff, Glenn’s flight was cut short.” Newsday also reported that the flight was “cut short.” An Associated Press article about the Cincinnati Testing Laboratories, which developed the heat shield for Glenn’s capsule, stated that Glenn was “completing the second of a planned seven orbits” when ground controllers detected a problem with Glenn’s heat shield and “decided to shorten the flight to three orbits.” A feature article in the Kansas City Star also reported that the plan had been for seven orbits, cut short to only three. What is the origin of this story? One suspects that it comes from the movie version of The Right Stuff and the oft-repeated bit of dialogue from mission control that Glenn was “go—at least seven orbits.” As he starts his third orbit, Glenn is told to begin his retrofire sequence and come down. He asks “Only three orbits?” and is told yes, only three orbits. The movie clearly implies that Glenn’s mission was cut short from seven orbits to only three. Now one could actually use logic to deduce that Glenn was never scheduled for seven orbits. After all, he landed in the Atlantic Ocean after launching at 9:47 am on February 20, 1962 from Cape Canaveral. Each orbit lasted approximately 90 minutes, meaning that if his flight was originally planned for seven orbits it would have lasted about ten and a half hours, or until after eight pm at night, well after dark. That did not make sense. Would NASA really want to try and recover an astronaut on a dark ocean? Logic alone strongly implies that the flight was not planned for seven orbits. Apparently the "go for 7 orbits" was a sign that an acceptable orbital insertion had occurred. Even though the mission was not planned for 7 orbits, it would have been 'capable' of going for at least 7.... splashdown conditions not withstanding. I have been reading Gene Kranz' book "Failure is Not an Option". He states, "The room hushed as Kraft and Tec Roberts engaged in the Go NoGo dialogue. The answer came swiftly and, after checking with john Hodge, the Bermuda flight director, Kraft nodded to Shepard, who gave Glenn a resounding, 'Go! You are Go for at least seven orbits.' (The orbital trajectory was designed to provide more orbit lifetime than needed for the mission plan in case we had problems and could not come down at the planned end of mission time.)" Two conflicting accounts...was it three or seven? The explanation in the first account here has good point, one being that splashdown would occur in the dark if it did go the full seven. But Kranz was there and he says otherwise. Maybe I didn't get the point across correctly. Kranz is saying that the mission was planned to be three orbits, but that the orbit was designed to give them extra time if needed before atmospheric drag caused the orbit to decay. OK, This looks pretty definitive. Three orbits were planned. This page has lots of other NASA goodies like this.